For more than 100 years, Pima County Public Library has been here for people just like you. Today, in our libraries, online, or out in the community, our dedicated staff and volunteers are here to help you find what you're looking for. Every day we're making our mission a reality by educating, connecting, and inspiring people. Headquartered in Tucson, Arizona, the Library provides services across 9,200 square miles, including Tucson and the surrounding communities of Arivaca, Green Valley, Sahuarita, South Tucson, Ajo, Marana, Oro Valley, and Catalina. The Library provides a wide range of free services that contribute to the economic development of the community. At the Library, people come first. We’re here for everyone in our community, offering services that support your creativity, individuality, and freedom of choice. Providing access to computers, learning tools, digital and print resources, entertainment, and a supportive, friendly staff are just some of the ways the Library powers possibilities and makes a difference in peoples' lives. We help create a strong community by teaching reading skills, providing books, and sharing stories. With reading as the foundation of all education, we help prepare young children to start school. For older children and adults, we offer services to become better readers. Reading is a building block in every success, including home life, health, education, and employment, and we take our role in building a community of readers very seriously. Anything is possible at the Library. Look to your Library as a place to explore, discover and learn new things. Students rely on us for quality information resources, homework help, or guidance pursuing higher education. Self-directed learners can take classes taught by qualified instructors or use online tools. Researchers can get assistance from knowledgeable librarians. Entrepreneurs embarking on new paths can get answers to business questions, while job seekers can boost their confidence and strengthen their resumes. At the Library, everyone—regardless of age, background, or means—has the opportunity to keep learning and dream BIG. Want to learn more? Visit our About Us page. Better yet, check out our calendar of events and join us in person! 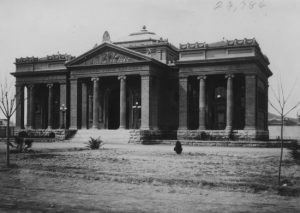 Tucson’s first public library, originally called the Carnegie Free Library, was founded in 1883. The first library building was partially funded by Andrew Carnegie’s campaign to build public libraries in the late 19th century. Carnegie committed to paying up to $25,000 to build a new library on the condition that the City of Tucson supplied a building site and provided $2,000 per year to maintain the library. The Tucson Common Council made good on this deal by passing Resolution Number 20. This resolution earmarked $2,000 per year for library maintenance, and designated a site for the library. The site used constituted a portion of Military Plaza. Carnegie Library, circa 1905. Image courtesy of the Arizona Historical Society/Tucson AHS24786. Architect Henry Charles Trost was hired to build the new library, which was completed in June of 1901. The Carnegie Free Library, administered by the city of Tucson, was located at 200 South 6th Avenue (current home of the Tucson's Children Museum). Initially, the library did not include a children’s room. This area was added after funds were raised in 1924. The library began with 2,000 volumes in 1891, but had grown to over 60,000 in 1942. A new 90,000 square foot facility opened downtown in May 1990. 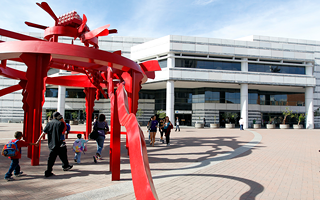 Today, this building is the Joel D. Valdez Main Library. On January 7, 1957 the name of the Carnegie Free Library was changed to Tucson Public Library by the Tucson City Council. This name was changed to the Tucson-Pima Public Library in 1990 when Pima County became more involved in the library’s operations. When Pima County took administrative control of the library system in 2006, we became Pima County Public Library. In addition to our Main and neighborhood branches, we offer a Bookmobile, Books-By-Mail, deposit collections, and an ever-growing variety of services online. CLSI/Geac system discontinued. Begin operations on Innovative Interfaces, Inc. The Lesbian, Gay, Bisexual, and Transgender Services Committee established to better serve southern Arizona's LGBT library users. Less than two months after it was created, the Committee's proposal in favor of Domestic Partner Benefits was passed 6-0 by the Tucson City Council. Pima County Bond Election includes $5,250,000 for Amphitheater School District/ Library joint-use school-public library (later used for the Oro Valley Library—an affiliate), a mid-town Tucson library, library facilities at the Kino Community Center, and expansion and improvements at South Tucson and Marana. El Rio Library relocated in slightly larger quarters in Neighborhood Center renovation. Miller-Golf Links Branch Library opens. City Bond election approved and includes $5.5 million for library projects: expansion of Miller-Golf Links to 15,000 SF; 10,000 SF full service library at Quincie Douglas Center; 7,000 SF library and learning center at midtown location. Tucson-Pima Public Library reading programs named Best Educational Boost Disguised as Fun in the Tucson Weekly's "Best of Tucson 2004"
Bear Canyon Library expansion completed, 11,000—15,000 sq. ft.
Quincie Douglas Library opened, 10,000 sq. ft.
Tucson-Pima Public Library kids' website earnes Best Local Website for Kids in the Tucson Weekly's "Best of Tucson 2006"
Wheeler Taft Abbett Sr. Branch Library opened, 20,000 sq. ft. Opening of Flowing Wells Library, 5,000 sq. ft.
Sahuarita Express Branch Library opened, 2,000 sq. ft.
Murphy-Wilmot Library re-opens, renovated and expanded to 20,000 sq. ft.
Eckstrom-Columbus Branch Library re-opens, renovated and expanded to 15,000 sq. ft.
Library Nurse Program receives the 2014 American Public Health Association's Lillian Wald Service Award. Culture Pass, a partnership between the Library and the nonprofit organization Act One, debuts at eight libraries, making meaningful arts experiences accessible to all. 5th Annual MegaMania!! event is held at Pima Community College Downtown Campus. Free and open to the public, this family-friendly celebration of all things comics, anime, cosplay, and art has has gained popularity since the inaugural event in 2011. Janni Lee Simner and Adrienne Celt serve as Library's first Writers-in-Residence, a program sponsored by the Arizona State Library, a division of the Secretary of State, with federal funds from the Institute of Museum and Library Services. Arizona Daily Star readers choose the Library as Best Adult Education Enrichment Classes (Favorite) and Best Arts/Cultural Education Programs (Winner) in the annual Readers' Choice Awards. Library staff files and documents. "Chronology of Library". Pima County Public Library Administration, 2008. "Councilmen rechristen the library." Arizona Daily Star. January 8, 1957. Page B1 and Staff notes. "County settle two lawsuits, buys flood-damaged home." Arizona Daily Star. November 15, 2006.